I visited St. Joseph for the first time over the past week. It was a lovely town; I would have liked to have stayed longer. Anyway,my father and I decided to visit Lions Park Beach while we were on our short vacation. It wasn’t very busy and the park was well-kept, which we both liked. The other beach report of this location failed to mention that this isn’t really a beach but a BREAKWALL with a strand of sand that is exposed during low tide. If you go during high tide, which we did, well then good luck. Fortunately, there was some actual “beach” further north down the shore, which I was able to walk on without getting wet. The breakwall itself is very short, making it easy to climb over. Despite the beach being gorgeously sandy, there were several rockbeds that has collected along the edge of the breakwall which I began to sift there. Unfortunately, I didn’t find much, but what I did find was pretty cool. 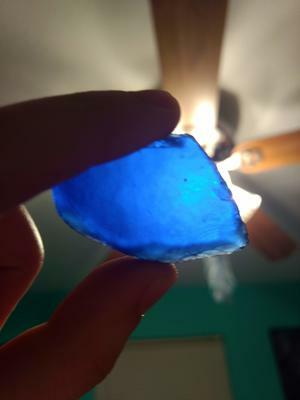 First of all, I found my largest piece of cobalt to date (my previous largest cobalt blue piece was found a week prior at Headlands Beach Park). It’s not very well frosted, but the size and width of it was so awesome that I couldn’t resist pocketing it. 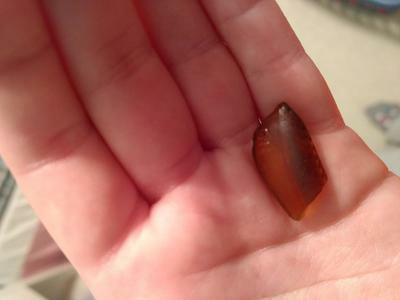 I also found curved pieces that probably came from the bottom of bottles. One of those pieces contain lettering, my first piece that has this feature. Funnily enough, the letters spell out, “NO,” which I think is a bad omen haha. If I lived in the area, I would come back during low tide and see what else I could find.